Parkinson’s disease (PD) is the second most common neurodegenerative disorder. 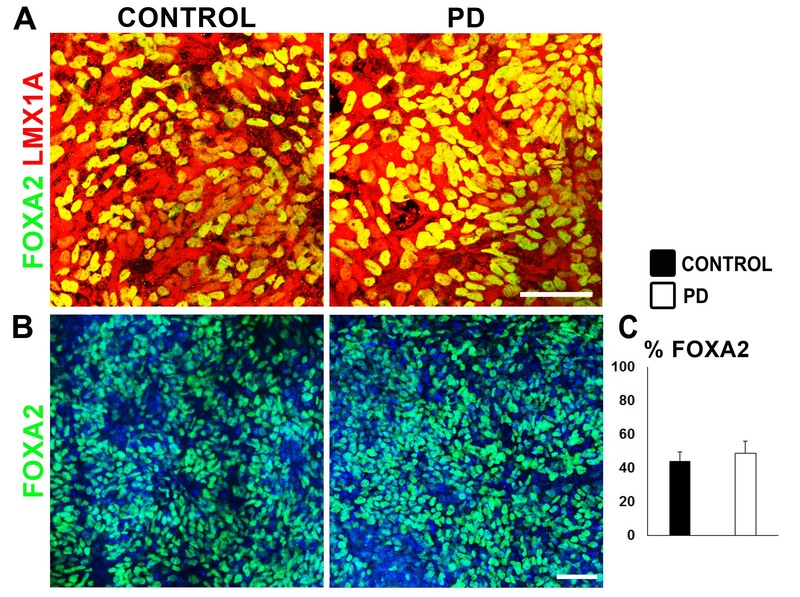 We have previously developed a disease-in-a-dish model for familial PD using induced pluripotent stem cells (iPSCs) from two patients carrying the p.A53T α-synuclein (αSyn) mutation. 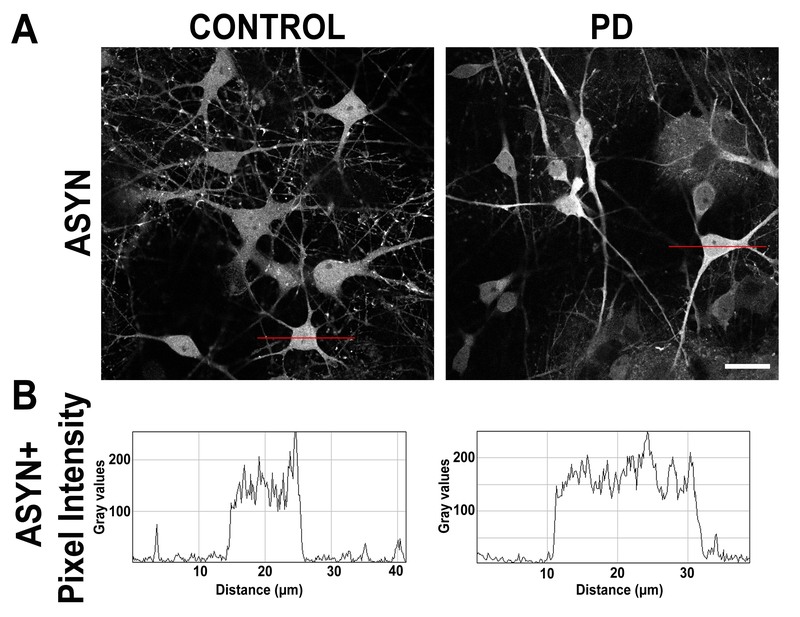 By directed differentiation, we generated a model that displays disease-relevant phenotypes, including protein aggregation, compromised neurite outgrowth, axonal neuropathology and synaptic defects. 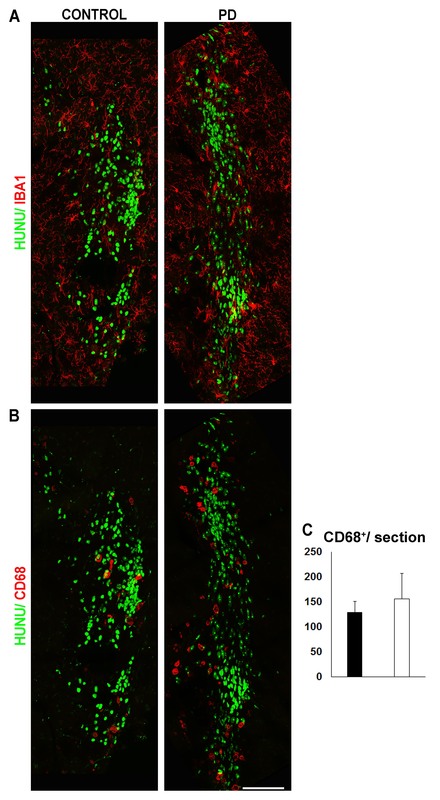 Here we investigated the in vivo phenotypes of iPSCs, derived from one patient, after transplantation in a lesion mouse model established by unilateral intrastriatal 6-hydroxydopamine injection in the immunosuppressed NOD/SCID strain. Immunohistochemistry revealed that despite the disease-related characteristics that mutant cells displayed when maintained up to 70 days in vitro, they could survive and differentiate in vivo over a 12-week period. However, some differences were noted between patient-derived and control grafts, including a significant rise in αSyn immunoreactivity that might signal a first step towards pathology. Moreover, control-derived grafts appeared to integrate better than PD grafts within the host tissue extending projections that formed more contacts with host striatal neurons. Our data suggest that the distinct disease-related characteristics which p.A53T cells develop in vitro, may be attenuated or take longer to emerge in vivo after transplantation within the mouse brain. Further analysis of the phenotypes that patient cells acquire over longer periods of time as well as the use of multiple iPSC clones from different patients should extend our current proof-of-concept study and provide additional evidence for in vivo disease modeling. 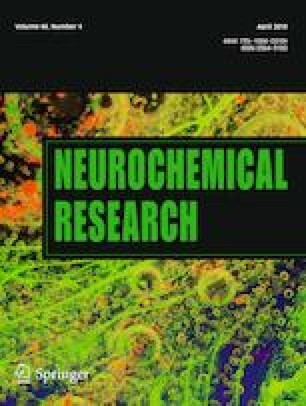 Special issue in honor of Prof Anthony J Turner. The online version of this article ( https://doi.org/10.1007/s11064-019-02781-w) contains supplementary material, which is available to authorized users. R.M. is grateful to Professor AJ Turner for mentorship and a life-long friendship. The authors thank Florentia Papastefanaki for constructive input throughout this study and help with figures and statistical analyses. This work was supported by: a grant from Stavros Niarchos Foundation to the Hellenic Pasteur Institute as part of the Foundation’s initiative to support the Greek Research Center ecosystem, the Institut Pasteur PTR-523 grant and the project “A Greek Research Infrastructure for Visualizing & Monitoring Fundamental Biological Processes” (MIS 5002755) implemented under the Action for Reinforcement of Research and Innovation Infrastructure funded by the Operational Program “Competitiveness, Entrepreneurship and Innovation” (NSRF 2014–2020) and co-financed by Greece and the European Union (European Regional Development Fund). O.Z. was awarded a scholarship from the State Scholarship Foundation (IKY) funded by the Action “Scholarships for post-graduate studies” (Operational Program “Education and Lifelong learning”, 2014–2020) and co-financed by the European Social Fund and the Greek government.